COMAC delivers eighth ARJ21 aircraft to Chengdu Airlines__Commercial Aircraft Corporation of China, Ltd.
COMAC delivered the eighth ARJ21 aircraft to Chengdu Airlines on October 15th, 2018. Commercial Aircraft Corporation of China, Ltd. (COMAC) delivered the eighth ARJ21 aircraft to Chengdu Airlines in Nantong, Jiangsu province on October 15th, 2018. 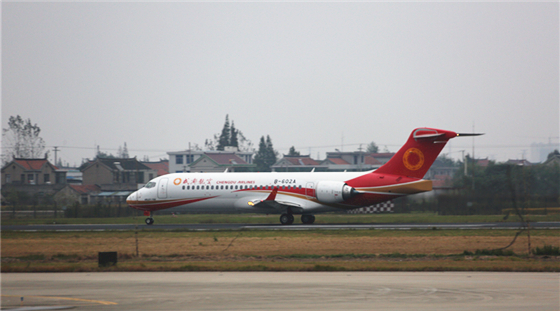 This brand new ARJ21 aircraft is purchased by SPDB Financial Leasing Co., Ltd. and leased to Chengdu Airlines. It is the sixth time to deliver an ARJ21 aircraft in the form of leaseback. This aircraft is in all economy-class cabin configuration and has seats for 90 passengers. ARJ21-700 AC113 with a nationality registration number of B-602A took off from Nantong Xingdong International Airport at 17:00 on the same day, and arrived at Chengdu Shuangliu International Airport at 19:38 after a flight of two hours and 38 minutes. The aircraft completed one delivery flight test in Nantong before flying to Chengdu to check the capacity of each system of the aircraft, passed CAAC certification after the procedures such as test data validation by the customer and customization, and successfully obtained the Standard Airworthiness Certificate (AC) for civil aircraft. So far, the ARJ21 fleet of Chengdu Airlines has accumulated more than 6,000 flight hours safely and carried more than 160,000 passengers. 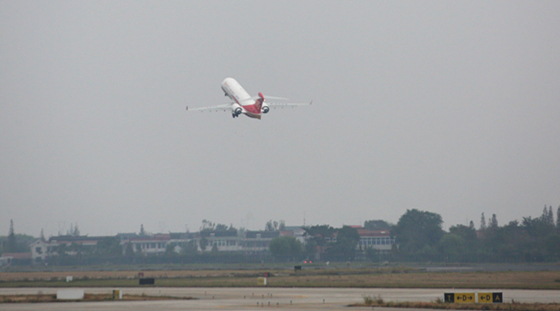 Recently, Chengdu Airlines opened the round trip of Chengdu-Nanning which was operated by ARJ21 aircraft every day. ARJ21 AC113 with a nationality registration number of B-602A took off from Nantong on October 15th, 2018.